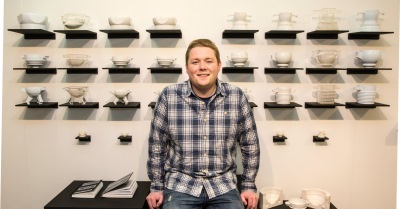 An Orcadian design student at Gray’s School of Art has shaken up the production of traditional Scottish objects as part of his final year project. Former Kirkwall Grammar School pupil, Ewan Gray, has explored how new techniques such as CAD (computer aided design) could revolutionise the production of traditional handcrafted Scottish items such as quaichs and celtic rings. The 23-year-old also employed rapid prototyping machines such as 3D printers to fabricate the items and help to create moulds. Ewan explained: “With the introduction of new technologies to art and design, the debate of handmade versus digital has continued to divide opinion. “Technology enables us to push boundaries, increase speed and achieve the impossible but the dependence on digital technology has resulted in work that has abandoned evidence of the human touch. “My aim in this project was to explore and determine the “value” of handmade processes and outcomes and why they should have a place in this digital era. Ewan, whose work is currently on display to the public at the annual Gray’s School of Art Degree Show until June 28, believes that a melding of traditional and modern approaches to design is the way forward. “I acknowledge the significance of evolution which is essential over time, however traditional handcrafted methods can coexist alongside new technology,” he said. “They offer the designer new ways to enhance their practice, giving the consumer more variety of choice. Ewan will graduate with a BA (Hons) in Three Dimensional Design in July and hopes to move into the oil and gas industry. The annual Gray’s School of Art Degree Show, sponsored for the eleventh year by BP, runs until June 28.